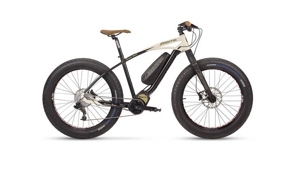 Fun, fast and fearsomely powerful, Fantic electric bikes combine Italian style and German technical expertise. 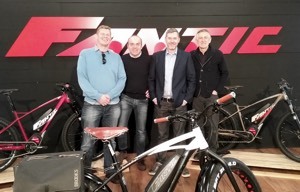 Last month we travelled to Fantic's newly-built headquarters, just outside Venice, to meet their team, tour their factory and test-ride their bikes. We found the riding characteristics of these bikes to be, frankly, amazing, and unmatched by anything 50cycles have offered over the years. There's enormous power on tap and it comes on silently. Those big 4-inch tyres eat up the terrain without complaint. Everything feels... right. So, we placed an order immediately and now there are Fantic bikes in stock to try and own. We've already sold several of the first delivery thanks to the show, but there are some left and many more to come. There are several models and variations to choose from, all fitted out with Brose's silently powerful mid-mount motor, 36V battery pack and crystal-clear handlebar display. They come with SRAM gears, a choice of well-cushioned, grippy tyres and shock absorbers, as well as a fully loaded Brooks model - Fantic have a bike for every day and every ride. Here's a summary of the Fantic range, which you can also see in full at 50cycles.com. Fantic's sporty off-road FAT SPORT mixes Italian style, German precision engineering and the best components from all over the world. In common with all models in the Fantic E-Bike range the motor comes from German automotive specialist Brose, a rising star in the E-bike world. 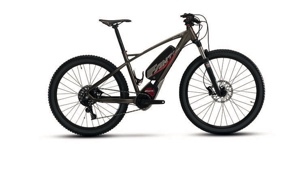 Batteries are supplied by German company BMZ, suspension forks from Rock Shox and the new SRAM GX drivetrain leads the way in terms of quality and performance. Designed for outdoor adventures, the Fat Sport lets you tackle even the hardest terrain and deepest country, reaching places that are inaccessible to other e-bikes. It's a deeply satisfying and thrilling way to explore and enjoy. Also, it looks incredible. Fantic have also designed an urban lifestyle fat bike called SEVEN DAYS, the first urban electric FAT in the world. Seven Days has similar performance characteristics to the FAT SPORT version but transforms, in its urban guise, into a tireless "mile-muncher". This bike's 4-inch tyres overcome all the problems caused by traffic and road surfaces - raised ironwork, tramlines, potholes are shrugged off and left behind. The Fantic SEVEN DAYS urban bike is available in three versions: Vintage, Carbon (with carbon fork) and Sport with its RockShox sprung front fork. Plenty of style and performance to match. 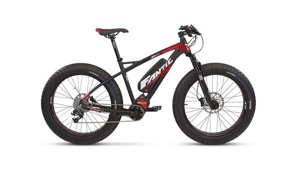 FAT SPORT and SEVEN DAYS were Fantics first e-bike models. Hot on their chunky heels this season are a pair of Brose motor-assisted mountain bikes, the XF2 Wheel Plus and XF3 semi 29er. The Fantic XF2 has tyres that take up the middle ground between the usual 2 or 2.5 inch mountain bike tyres and 4 or even 5 inch FatBike tyres. Such Plus size tyres excel on loose, rubbly surfaces while offering great grip and stability in all conditions. They make for confident riding, whatever your technical skill. As well as the Brose centre motor and Fantic's design, these all-terrain bikes have a very interesting characteristic, a 29-inch front wheel and 27.5" rear wheel. The XF3 Race also comes kitted-out with SRAM's new 11-speed gears. Agility and great handling mark this out as a great mountain bike.